We could pretty much devote an entire blog to Chinatown's three main Asian food courts: Eating World, Dixon House and The Sussex Centre. We love them all and have favourite stalls in each. Today Miss Chicken, Mr T and I hit the Sussex Centre because I'm in the mood for bibimbap, and it's all about me, right? The Sussex Centre is is the flashest of the Chinatown food courts and the best one to bring you mum to. Being upstairs it is light and airy and if you grab a seat by the window it's a great place to watch the world go by. They even have clean toilets and hot water taps in the wash basins. Joy. In the corner at the Dixon Street end is a very popular Korean stall called Wooree BBQ. Some days you have to fight the crowds of hungry Korean students but today I beat the rush. I have been coming to Wooree BBQ for years for their bibimbap. Bibimbap is one of those dishes that is far more than the sum of its parts: plain rice with beef and veggies, both pickled and fresh. It is topped with a fried googy egg. It doesn't sound flash but it tastes great and makes you feel good. It must be something to do with the balance of carbohydrates, protein and veggies, I just always feel better after a bibimbap. 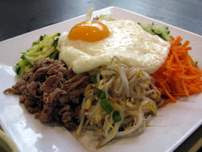 To eat a bibimbap you break the egg yolk and mix it through and stir in some of Korean chilli sauce. I must admit I was disappointed to see that Wooree BBQ has switched to using fancy-pants square plates rather than the traditional bowl. It is probably my imagination but bibimbap just tastes better in a bowl, everything mixes together better. Mr T goes for the Korean chili chicken, kind of like a chicken bulgolgi. Interestingly the little side salad is dressed with prawn cocktail sauce: that retro mix of mayonnaise and tomato sauce. Miss Chicken goes wild and heads for the mysterious Ginseng Plus stall, in the opposite corner, also at the Dixon Street end. Can you guess what dish this is? Did I hear you say 'spicy intestines with rice casserole?' You got it, ten points. This dish is highly recommended to gizzard-friendly folks, it has plenty of innards, glass noodles and many delicious ingredients of mystery. The Sussex Centre Food Court is at 401 Sussex Street, Chinatown. Head up the escalator into a world of cheap eats street food glory. What is the opening and closing times I cant find out anywhere on the net! I agree with Lucy about dolsot bibimbap. I have been ordering what the menu describes as "hotpot bibimbap" from Wooree for years. It comes in a battered old stone bowl and is always excellent. The rice goes crunchy on the bottom. But here the beef is cooked. Lots of chilli sauce and sprinkle of toasted sesame seeds. I never get enough protein to keep me satisfied, so I always carry a couple of raw eggs in my coat pockets. Whenever I visit one of the Chinatown food courts and order a bibimbap, ramen or pho I look out to see that no one is looking and crack an egg or two into my meal. This way I don't have to spend money on two meals to get satisfied. What a great idea with the eggs! Hope no one slaps you on the pocket by accident - a wee bit messy.